Let’s take a journey back to the ’70s. Guitars and guitar-based rock ‘n’ roll music had reached a level of popularity that would last well into the early 2000s. While heavy riffs and searing solos dominated the airwaves, the quality manufacturing of the classic instruments synonymous with the culture — guitars like Gibson’s Les Paul and SG, Fender’s Stratocaster and Telecaster — was beginning to decline significantly from a production standpoint. The careful attention to detail, superior parts, and meticulous craftsmanship diminished, while price tags remained high. Harry Rosenbloom, owner of Medley Music in Bryn Mawr, Pennsylvania, made his living selling handmade instruments. Sensing the domestic guitar market’s downturn, however, Rosenbloom’s company, Elger Guitars, became the sole North American distributor for Japanese guitar manufacturers, Hoshino Gakki Gen.
Hoshino began importing classical guitars from a small, Spanish guitar maker named Salvador Ibáñez in the ’20s to sell in Japan, and went onto launch their own brand under the name Ibanez, inspired by the imported guitars in 1935. Rosenbloom, sensitive to the domestic hostility towards Japanese products still prevalent in the late ’60s, used this as the brand name for his imported guitars. In 1971, Hoshino became profitable enough to purchase Elger Guitars from Rosenbloom and officially changed their name to Ibanez, USA. Ibanez achieved US success when it began manufacturing copies of classic Fender, Gibson, and Rickenbacker guitars in the late ’60s. While Gibson and Fender guitars declined in quality, Japanese copies were, at least visually, markedly on par with the American originals. + Learn more on Soundfly: Check out our new free course with legendary guitarist, Kaki King, on how and why she uses a digital pedalboard, a MIDI foot controller, and expression pedal in place of her analog board on the world-tour circuit. 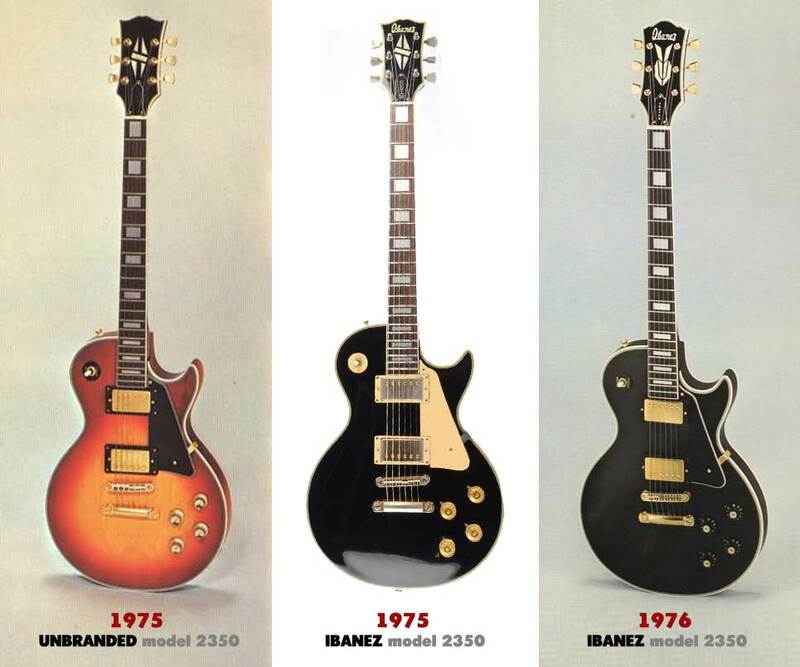 Catalog images of the Ibanez model 2350. 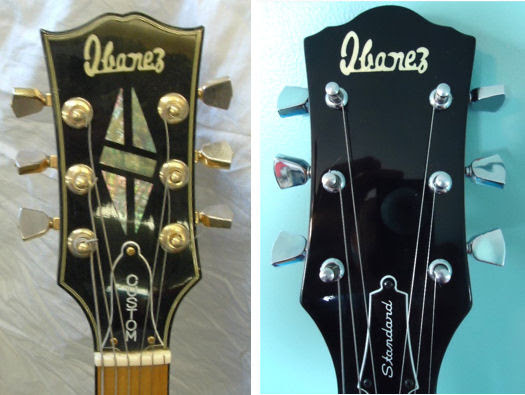 The left image features a non-branded headstock. The center image boldly displays the Ibanez brand on the head. And the guitar on the right features an entirely new design with a new head shape. Although not built to the same specifications as their American counterparts — many of which sported bolt-on necks, inferior electronics, and multi-piece plywood tops — the Japanese instruments were utilitarian, had personality, and were faithful to the original designs. They were quickly embraced by novice players and those who didn’t want to shell out their hard-earned cash for a guitar of questionable quality. American guitar brands felt the hit. Fernandes created faithful recreations of Fender instruments; and Takamine and Suzuki both made acoustic guitars nearly identical to certain Martin models. Interestingly, most Japanese copies of the time didn’t have serial numbers — a great way to tell if an instrument is truly a “lawsuit” guitar, even today. The early logo of Takamine looked exactly like the Martin logo. Speaking of which, in 1977, Gibson’s parent company filed a lawsuit against Ibanez (essentially the Hoshino corporation) for copying their “open-book-style” headstock. An image of pre-lawsuit Ibanez (left) and post-lawsuit Ibanez. Notice the “open book” Gibson ripoff vs. the second design. 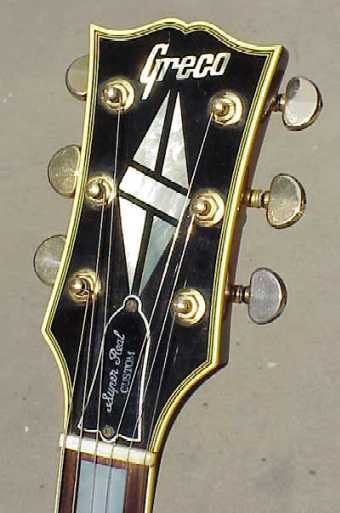 The lawsuit was settled out of court, and Ibanez replaced the headstock with a revised design. Ibanez ramped up the quality of its own designs, including set-in-neck copies of solid body and archtop guitars. Soon after, it rolled out its own line of signature instruments like the Iceman and Destroyer, which set the tone for the company-defining instruments of the ’80s and ’90s. A tone befitting the international rise of heavy metal! On the left, a late-’70s Ibanez Destroyer. In the center, a 1978 Ibanez Iceman Artist IC300. On the right, a ’76 Ibanez Firebrand. So, what’s the salacious “true story” we promised earlier? 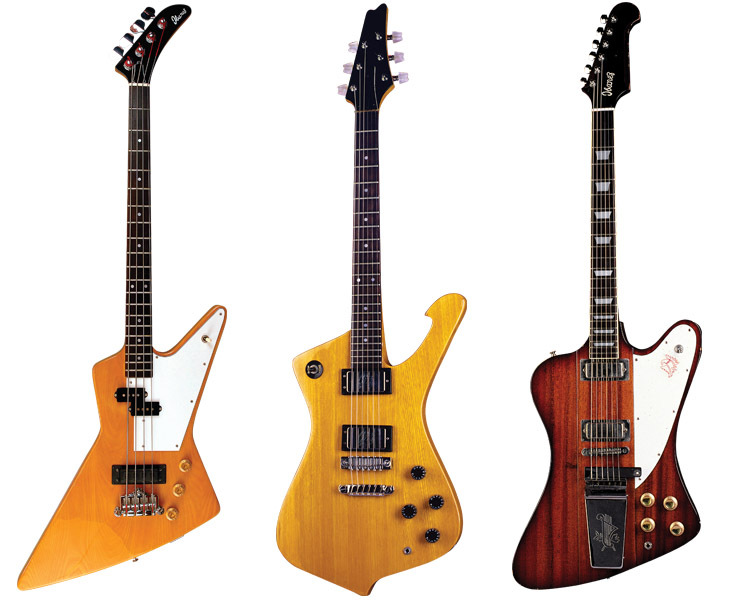 Most instruments that claim to be “lawsuit-era” guitars simply aren’t. That isn’t to say they aren’t cool, functional instruments with unique character — quite the contrary. The only technical “lawsuit” guitars are Ibanez models, or other branded guitars manufactured by Hoshino, that look nearly identical to Gibson or Fender guitars, save for the name on the headstock and some technical specifications. They mostly originated out of the FujiGen Gakki plant in Japan and were imported to the US. At the same time that Japanese guitar factories were making copies of American designs, they were also tinkering with unique designs of their own. It’s not uncommon to see guitars from this period sporting wild body designs, as many as four pickups, and some curiously organized pickup selectors and knobs. 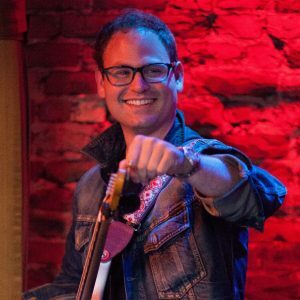 Are these “lawsuit” guitars? Absolutely not. Are they still cool? Most definitely. The Greco 950 is one of the coolest non-copied designs to come from Japanese factories. The Greco 950 (a.k.a. “The Shrike”) was made at the Teisco factory between 1967 and 1969. What about all those copies you see online? 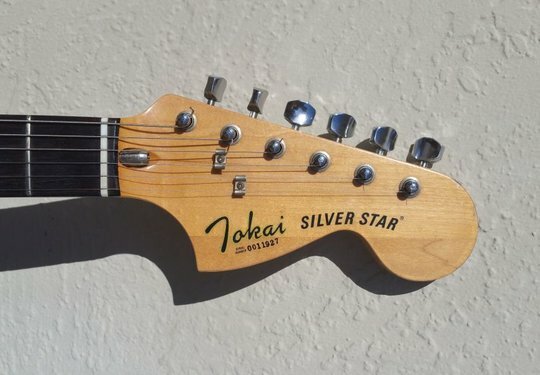 Sellers on third-party sites like eBay win on a technicality by billing these instruments as “lawsuit-era guitars,” both expanding the range of guitars included to anywhere between the late ’60s to early ’80s, and implying the guitars are made in Japan without saying it outright. But, buyer beware. There are a lot of guitars falsely credited to Japanese manufacturers that were actually made in China and Korea. 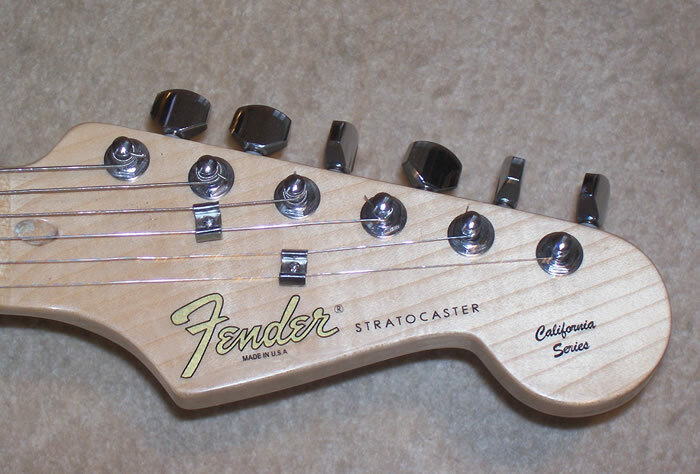 Responding to the market’s desire for lower priced instruments, Fender opened its own Japanese plant in 1982. The Japanese Fender guitars are not “lawsuit guitars.” But, they tend to be great, high-quality instruments. In 1984, Fender’s parent company sold it to new owners, and in the following years, production in the US slowed as management transitioned. Most of the instruments sold during this period were old-stock American guitars and imported Japanese guitars, which gave the market time to adjust to the presence of these new, low-cost instruments bearing the Fender name. The results of “lawsuit-era” guitar making are still felt today. Most high-end guitar manufacturers have overseas plants that produce lower cost versions of their instruments for hobbyists, students, and professionals alike. Gibson bought Epiphone, and Fender created the Squier line, further proof of these lower cost instruments’ success. For anyone in the market for a vintage instrument, the Japanese guitars from the ’70s and ’80s are great choices that don’t command the outrageous price tags of their American counterparts. Just be wary of sellers using the word “lawsuit” to drive up the asking price of their vintage Japanese instruments, and try to ask a lot of questions. If you’d like to learn more about the story of Ibanez, this book covers it, well, cover to cover! For 6String Minutes, I’m reporter Elyadeen Anbar, signing off. 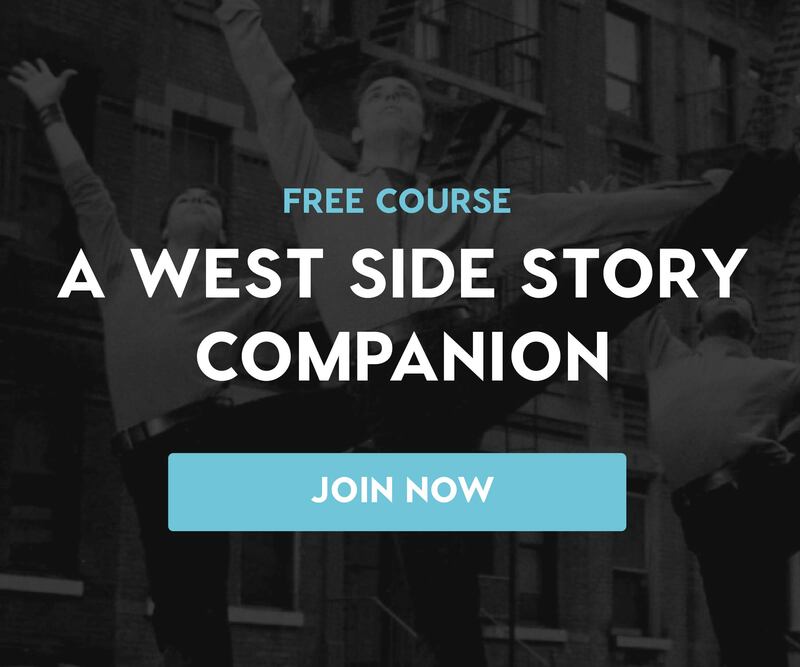 Explore our growing array of Mainstage courses that feature personal support and 1-on-1 mentorship from experienced professionals in the field, including Unlocking the Emotional Power of Chords, Orchestration for Strings, and The Creative Power of Advanced Harmony.